When the author felt the call of Christianity, unexpectedly and without plan, he found Jesus and devoted his life to serving rather than being served. Michael Levitton had always fended for himself and worked out his own problems. But as a part of his new Christian life, he found himself looking to the Bible for answers, and read it cover to cover every year. It gave him inspiration not only for his own life but to share with others. 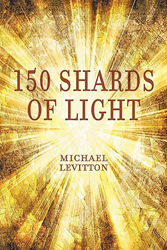 When the book "Fifty Shades of Gray" became a success, he decided to answer the title with his own "150 Shards of Light". He compiled articles he had written, alone with retelling of Bible stories, meant to appeal to those less familiar with the material, told in a way to be current and accessible. The book's new digital editions will make the stories available to an even wider audience worldwide, something very important to the author. “This fresh and personal retelling of Bible stories makes them relatable to a new audience. We are pleased to announce its digital release,” said Robert Fletcher, CEO of Strategic Book Publishing and Rights Agency. About the Author: Michael Levitton grew up in the counties of Norfolk and Buckinghamshire, England. He is retired and devotes his time to serving God and his Kingdom. This is his first book. at Amazon and other online sellers. The soft cover version (ISBN: 978-1-68181-215-1, $18.50) can also be ordered through the publisher’s website: http://sbprabooks.com/MichaelLevitton or at Amazon and other online sellers.